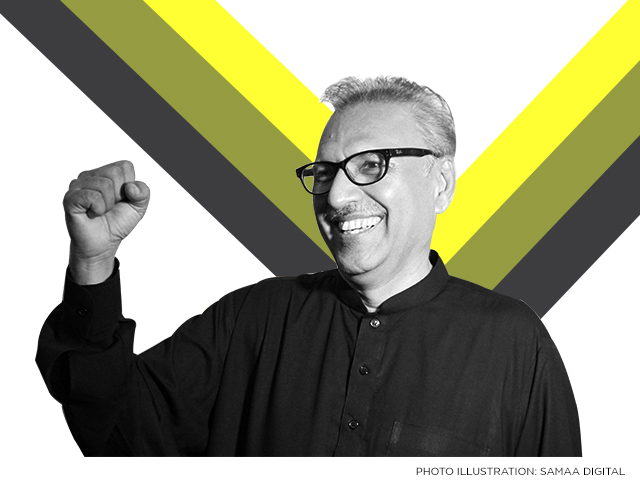 The PTI’s Arif Alvi was elected 13th President of Pakistan on Tuesday. According to unofficial results, Alvi secured a total of 353 votes from the two houses of Parliament and the four provincial assemblies. JUI-F’s Maulana Fazl-ur-Rehman got 185 and PPP candidate Aitizaz Ahsan got 124 votes. The president was elected by an electoral college made up of members of the Senate, National Assembly and the assemblies of the four provinces. In the Senate and National Assemlby, Dr Alvi obtained 212 votes, Fazl-ur-Rehman 131 and Ahsan 81, according to the unofficial result. In Punjab Assembly, Alvi got 33 votes, Fazl-ur-Rehman 25 and Ahsan one, as 351 out of 354 MPAs cast their votes. Eighteen votes were rejected, 16 of which were cast by PML-N MPAs. In Balochistan Assembly, Alvi secured 45, Fazl-ur-Rehman 15, while Ahsan got no vote, as 60 out of 61 MPAs cast their votes. In KP Assembly, Alvi got 41, Fazal 14 and Ahsan 3, as 111 out of 112 MPAs cast their votes. In Sindh Assembly, Alvi got 22 votes, Ahsan 39, while Fazl-ur-Rehman got no vote, as 158 out of 163 MPAs cast their votes. Election commissioners and chief justices of respective high courts oversaw the voting process in all four provincial assemblies. Earlier, the country’s elected representatives voted to elect Pakistan’s 13th president. Members of the National Assembly, provincial assemblies and Senate took part in the polling from 10am to 4pm. The PTI enjoyed the support of the MQM, PML-Q, BAP, GDA, BNP-Mengal, AML and Jamhoori Watan Party in the National Assembly and all four provincial assemblies. The opposition, comprising the PPP, PML-N, MMA and ANP, however, was divided. There will be 330 MNAs and 102 senators who will cast their votes at Parliament House. The PTI and PML-N’s parliamentary committees have convened to discuss the election. As of 11am, no one from the PML-N cast their vote. Twenty to 25 leaders had cast their votes as of 11:10am. Senate Chairperson Sadiq Sanjrani, who was admitted at a hospital, came to Parliament House to cast his vote. PML-N President Shehbaz Sharif arrived at the NA at 11:40am to cast his vote. Prime Minister Imran Khan arrived at 3:20pm to cast his vote. In Quetta, 61 of the 65 members of the provincial assembly will cast their votes. Four seats are still vacant. The PB-35 Mastung seat is empty after the death of Nawabzada Siraj Raisani. The official notification of the results for the elections for PB-41 Washuk and PB-26 Quetta has not been issued yet. The PB-40 Wadh seat was left vacant after Sardar Akhtar Mengal chose to retain his NA seat instead. The BAP has the most seats in the Balochistan Assembly. It has 24 compared to the MMA’s 10. BNP-Mengal has nine while the PTI has eight. The ANP also has four seats whereas the BNP-Awami has three. The Hazara Democratic Party, PML-N, Jamhoori Watan Party and PkMAP each have one seat. The voting process is being presided over by Balochistan High Court Chief Justice Tahira Safdar. The first vote was cast by the MMA’s Abdul Wahid Siddiqui. There will be 163 votes cast today. The PPP has 98 votes, PTI has 28, MQM has 20 and GDA has 14. Two imprisoned MPAs — PPP leader Sharjeel Memon and the MQM’s Javed Hanif — have been brought to the assembly to cast their votes. Sindh High Court Chief Justice Ahmed Ali Shaikh is the presiding officer for the election. PPP leader Nighat Orakzai was the first person to cast her vote. Of the 112 MPAs who will cast their votes, 111 have already done so. Voting is being presided over by Peshawar High Court Chief Justice Seth Ahmed Waqar. PTI’s Abdul Aleem Khan cast the first vote in the assembly. As of 12:16pm, 102 votes were cast. Punjab Chief Minister Usman Buzdar also cast his vote. So far, the government has a combined 361 votes while the joint opposition has 326 votes. This includes votes from independent candidates aligned with the parties and political alliances. In the National Assembly, the PTI-led government has 179 votes with the help of independent candidates. The joint opposition has 151 votes. In the Senate, the joint opposition has 66 votes to the government’s 36. Each provincial assembly has a different number of seats, so to ensure equal representation in the election votes from each province are counted differently. In Punjab, 5.44 votes are counted as a single vote. According to this, the government has 34 votes and opposition has 31. In the Sindh Assembly, 2.43 votes are counted as one, so the opposition has 40 votes while the PTI-led government has 25. In Khyber Pakhtunkhwa, 1.7 votes are counted as one so the opposition has 19 and the government has 46. In the Balochistan Assembly, each vote is counted as one, so the government has 41 votes, while the opposition has 19. A joint Parliament session was held in which MNAs and senators exercised their right to vote through a secret ballot. Provincial assemblies also held sessions for the election. The five-year term of President Mamnoon Hussain will expire on September 9. President Hussain, who was elected in September 2013, was a nominee of the PML-N.